Our extensive catalogue features hundreds of styles available for order. Wall mirrors are a fantastic way to visually add extra space and light to any room. They also provide a sense of grandeur and elegance, further highlighting the décor of any home or office. Whether your taste is contemporary, traditional, or “I’ll know it when I see it,” we’ve got the perfect mirror for you. Our extensive collection of framed wall mirrors includes a range of styles, including Modern, Art Deco and Art Nouveau, as well as more elaborate, traditional designs. We also offer framed Cheval mirrors, which are vertical, free-standing, floor mirrors generally used in bedrooms, and Leaner mirrors that, as the name suggests, lean against the wall. These mirrors are usually quite large, and make a stunning focal point in any room. 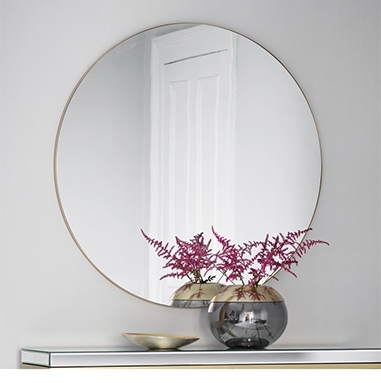 We also have a broad range of round wall mirrors in many different sizes and with various finishes and colours. If it turns out that you can’t find the perfect mirror on display, we can show you several catalogues containing hundreds of others. On most occasions, we can order your choice of mirror with no obligation to buy if you are not entirely happy with it upon its arrival. If, on the other hand, you know exactly the wall mirror you want but are having difficulty finding it in-store anywhere, please give us a call. We source our mirrors from many suppliers, both local and international, and will do our best to locate it for you. In today’s world, we know that people sometimes find the mirror they want on the internet. If you are considering an online mirror purchase, please give us a call first as we can generally supply the same mirror at the same price. Not only does an in-store purchase come with the bonus of actually being able to see and look into the mirror, it also means you can carefully inspect it for any possible defects. 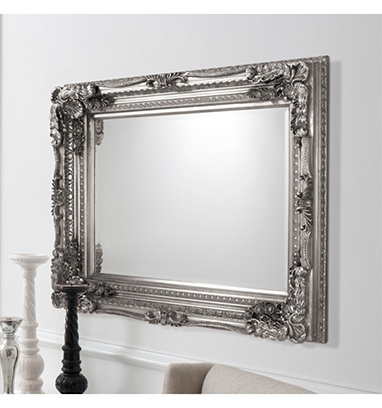 Why risk the potential hassle and cost of having to ship back an online purchase when you can buy exactly the mirror you want with confidence in its appearance and quality? If you’re thinking of buying a mirror but can’t decide how big it should be, generally speaking, it’s a good idea to choose a mirror that’s an appropriate size for your wall space. A small mirror on a large wall will simply look lost, but a large mirror there will open up your room by adding light and a sense of extra space. It could even liven up an otherwise blank wall space by bringing your garden or favourite view into the room. Alternatively, if a mirror is to be mounted above a piece of furniture, it can be as wide as the furniture but should not extend beyond it. The mirror will impart a great sense of style and allow both pieces to complement one another. If you have a space that requires a specific size mirror, we can custom make a framed mirror to your exact requirements. This is ideal for a space such as a wall niche or if you have an alternative shape in mind. We can also custom-frame wall mirrors to match or complement your furniture colours. We have over seven-hundred frame mouldings on display and, when you consider that many of them can be used together, there is a myriad of choices. This is where our design expertise, based on more than thirty years’ experience, comes into play to assist you. Need Help with the Hanging? All of our wall mirrors come with the appropriate hanging hardware and advice on proper installation according to the type of wall. If you are not entirely comfortable with hanging a mirror or do not have the tools or time available, we can suggest competent installers to help you. They are usually available within a few days of your mirror purchase. Mirrors are often large and don’t fit into regular-size sedans. If this is the case, we have a dedicated courier who specialises in the delivery of large, sensitive items. He is available at short notice and can typically deliver your mirror at a time of your choosing. If you are in South Australia, come and visit us in our Unley Road store in Malvern to view one of the largest selections of framed wall mirrors in Adelaide.